The egolution continues with the Martin ego 03, a unique, 250-watt deco effect that projects a psychedelic swarm of swirling colors. Identical in appearance to brothers 01 and 02, Martin ego 03 is nevertheless a completely new and unique individual. Based on a kaleidoscopic system of revolving mirrors, its swarm of swirling colors leaves dancers entranced. Martin ego 03 features high precision optics, a specially designed color/gobo wheel, and sharp and detailed kaleidoscopic gobo designs, all in a great looking composite shell. Other features include variable behavior options, selectable auto or music trig, remote operation, switch mode power supply and much more. The Philips ELC/5H, 24 V / 250 watt source (included) gives up to 1000 hours of operation. A continuous duty cycle and fan cooling means the effect runs all night with no cool down time needed. 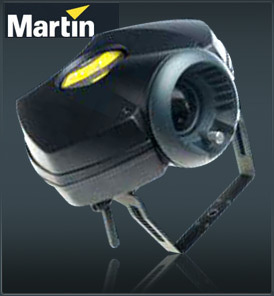 Martin ego 03 houses extremely sharp projection optics that combine with precise manual focus adjustment to produce detailed, clear projections. At only eight pounds ego 03 is both lightweight and highly portable. The composite design is made of rugged molded plastic and looks great in a rig. A convenient handle and lens protection ring makes for easy transport and handling, and a switch mode power supply makes set up even more straightforward. A special ego carrying bag is also available which will hold two fixtures. Martin ego 03 can be used in a wide variety of DJ and club applications and joins the initial Ego versions, ego 01 and ego 02, to form a genuine collector range.